The Hubble Space Telescope (HST) turns 25 this month. A readers' choice image from her gallery is featured on the cover, and the magazine is filled with many beautiful observations from HST that have helped us explain the mysteries of our universe. Issues are provided in PDF format. Download Adobe Reader<http://get.adobe.com/reader/>. View the current issue<http://www.nasa.gov/sites/default/files/files/apr2015v2.pdf> which is 9MB. Spaceport Magazine is a monthly NASA publication that serves Kennedy Space Center employees and the American public. The magazine's wide topic variety mirrors Kennedy's diverse spaceport operations. From launch processing to center development and employee stories, Spaceport Magazine's feature writing seeks to inform and entertain. 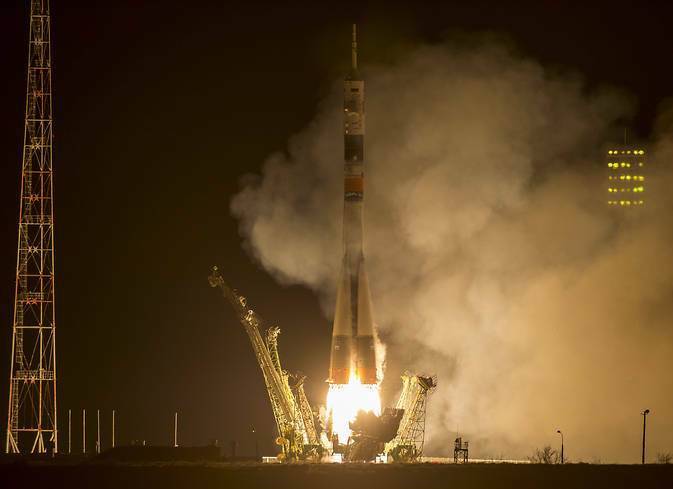 The Soyuz TMA-16M spacecraft is seen as it launches to the International Space Station with Expedition 43's NASA Astronaut Scott Kelly and Russian cosmonauts Mikhail Kornienko and Gennady Padalka of the Russian Federal Space Agency (Roscosmos) onboard Friday, March 27 (Saturday, March 28 Kazakh time) from the Baikonur Cosmodrome in Kazakhstan. 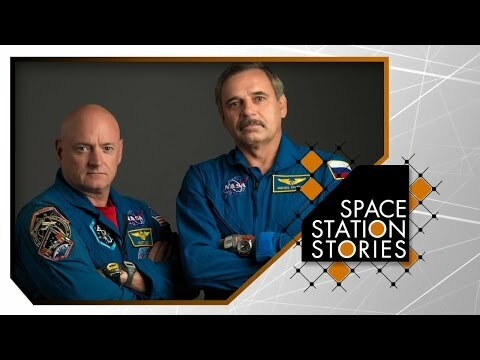 NASA astronaut Scott Kelly and Russian Federal Space Agency (Roscosmos) cosmonaut Mikhail Kornienko will spend about a year living and working aboard the space station to help scientists better understand how the human body reacts and adapts to the harsh environment of space. 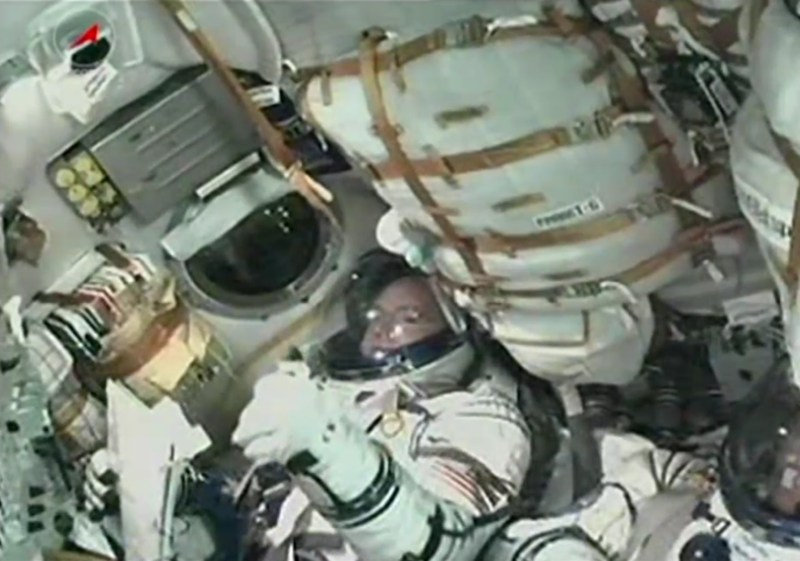 NASA astronaut Scott Kelly gives a thumbs-up from inside the Soyuz TMA-16M taking him and Expedition 43 crewmates Mikhail Kornienko, and Gennady Padalka of the Russian Federal Space Agency (Roscosmos) to the International Space Station after a successful launch from the Baikonur Cosmodrome in Kazakhstan. duration spaceflight affects the human body." Launching with Kelly and Kornienko was cosmonaut Gennady Padalka, who will spend a standard six-month rotation on the station. The trio is scheduled to dock with the station at 9:36 p.m., about six hours after launch. NASA Television coverage of docking will begin at 8:45 p.m. Hatches are scheduled to open at about 11:15 p.m., with coverage starting at 10:45 p.m.
Expedition 43 crew members Mikhail Kornienko of the Russian Federal Space Agency (Roscosmos), top, NASA astronaut Scott Kelly, center, and Gennady Padalka of Roscosmos wave farewell as they board the Soyuz TMA-16M spacecraft ahead of their launch to the International Space Station. 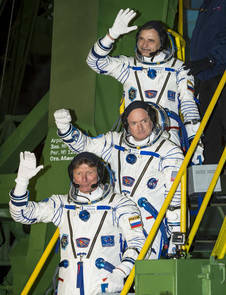 The arrival of Kelly, Kornienko and Padalka returns the station's crew complement to six. 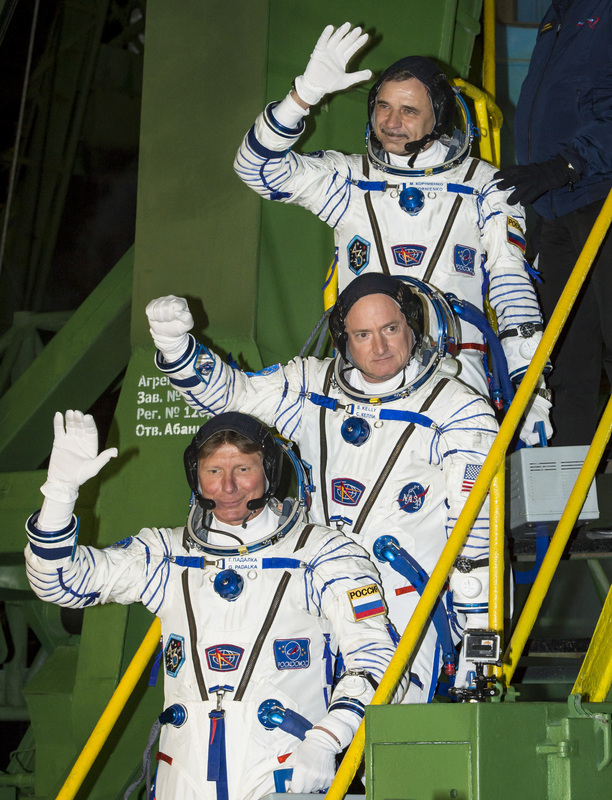 The three will join Expedition 43 commander Terry Virts of NASA, as well as flight engineers Samantha Cristoforetti of ESA (European Space Agency) and Anton Shkaplerov of Roscosmos, who have been aboard the complex since November. NASA astronaut Scott Kelly and Russian cosmonaut Mikhail Kornienko will spend nearly twelve months conducting important human research studies that will provide new insights into how the human body adjusts to weightlessness, isolation, radiation and stress of long-duration spaceflight. Virts, Cristoforetti and Shkaplerov will return home in May. At that time, Padalka will take command of Expedition 44, becoming the first person to command four station crews. Padalka will return in September, while Kelly and Kornienko will remain aboard until March 2016. The one-year mission will focus on seven key areas of human research. Functional studies will examine crew member performance during and after the 12-month expedition. Behavioral studies will monitor sleep patterns and exercise routines. Visual impairment will be studied by measuring changes in pressure inside the human skull. Metabolic investigations will examine the immune system and effects of stress. Physical performance will be monitored through exercise examinations. Microbial changes in the crew will be monitored, as well as the human factors associated with how the crew interacts aboard the station. Each of these key elements carries a potential benefit for populations here on Earth, from functional improvements for patients recovering from a long period of bed rest to improving the monitoring of immune functions of people on Earth with altered immunity. Data from Kelly and Kornienko's 342-day expedition will be used to determine whether there are ways to further reduce the risks on future long-duration missions necessary for deep space missions. In tandem with the one-year mission, Kelly's identical twin brother, former NASA astronaut Mark Kelly, will participate in a number of comparative genetic studies, including the collection of blood samples as well as psychological and physical tests. This research will compare data from the genetically identical Kelly brothers to identify any subtle changes caused by spaceflight. The tests will track any degeneration or evolution that occurs in the human body from extended exposure to a microgravity environment. These new twin studies are a multi-faceted national cooperation between universities, corporations and government laboratory expertise. Expedition 43 will perform scientific research in several other fields, such as astrophysics and biotechnology. Among the planned experiments are a study of meteors entering Earth's atmosphere and testing of a new synthetic material that can expand and contract like human muscle tissue. The crew members also are scheduled to greet a host of cargo spacecraft during their mission, including the sixth SpaceX commercial resupply flight and a Russian Progress resupply mission. Each flight will carry several tons of food, fuel, supplies and research. No spacewalks are planned during Expedition 43. The International Space Station is a convergence of science, technology and human innovation that demonstrates new technologies and makes research breakthroughs that are not possible on Earth. The space station has been continuously occupied since November 2000. In this time, it has received more than 200 visitors and a variety of international and commercial spacecraft. The space station remains the springboard to NASA's next giant leap in exploration. A Sample Analysis at Mars (SAM) team member at NASA Goddard prepares the SAM testbed for an experiment. This test copy of the SAM suite of instruments is inside a chamber that, when closed, can model the pressure and temperature environment that SAM sees inside Curiosity on Mars. NASA's Curiosity rover is using a new experiment to better understand the history of the Martian atmosphere by analyzing xenon. While NASA's Curiosity rover concluded its detailed examination of the rock layers of the "Pahrump Hills" in Gale Crater on Mars this winter, some members of the rover team were busy analyzing the Martian atmosphere for xenon, a heavy noble gas. Curiosity's Sample Analysis at Mars (SAM) experiment analyzed xenon in the planet's atmosphere. Since noble gases are chemically inert and do not react with other substances in the air or on the ground, they are excellent tracers of the history of the atmosphere. Xenon is present in the Martian atmosphere at a challengingly low quantity and can be directly measured only with on-site experiments such as SAM. "Xenon is a fundamental measurement to make on a planet such as Mars or Venus, since it provides essential information to understand the early history of these planets and why they turned out so differently from Earth," said Melissa Trainer, one of the scientists analyzing the SAM data. A planetary atmosphere is made up of different gases, which are in turn made up of variants of the same chemical element called isotopes. When a planet loses its atmosphere, that process can affect the ratios of remaining isotopes. 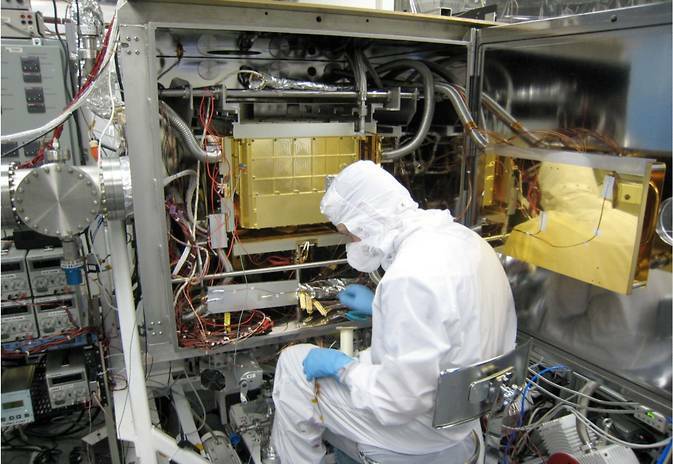 Measuring xenon tells us more about the history of the loss of the Martian atmosphere. The special characteristics of xenon - it exists naturally in nine different isotopes, ranging in atomic mass from 124 (with 70 neutrons per atom) to 136 (with 82 neutrons per atom) - allows us to learn more about the process by which the layers of atmosphere were stripped off of Mars than using measurements of other gases. A process removing gas from the top of the atmosphere removes lighter isotopes more readily than heavier ones leaving a ratio higher in heavier isotopes than it was originally. The SAM measurement of the ratios of the nine xenon isotopes traces a very early period in the history of Mars when a vigorous atmospheric escape process was pulling away even the heavy xenon gas. The lighter isotopes were escaping just a bit faster than the heavy isotopes. Those escapes affected the ratio of isotopes in the atmosphere left behind, and the ratios today are a signature retained in the atmosphere for billions of years. This signature was first inferred several decades ago from isotope measurements on small amounts of Martian atmospheric gas trapped in rocks from Mars that made their way to Earth as meteorites. "We are seeing a remarkably close match of the in-situ data to that from bits of atmosphere captured in some of the Martian meteorites," said SAM Deputy Principal Investigator Pan Conrad. SAM previously measured the ratio of two isotopes of a different noble gas, argon. The results pointed to continuous loss over time of much of the original atmosphere of Mars. The xenon experiment required months of careful testing at NASA's Goddard Space Flight Center in Greenbelt, Maryland, using a close copy of the SAM instrument enclosed in a chamber that simulates the Mars environment. This testing was led by Goddard's Charles Malespin, who developed and optimized the sequence of instructions for SAM to carry out on Mars. "I'm gratified that we were able to successfully execute this run on Mars and demonstrate this new capability for Curiosity," said Malespin. NASA's Mars Science Laboratory Project is using Curiosity to determine if life was possible on Mars and study major changes in Martian environmental conditions. NASA studies Mars to learn more about our own planet, and in preparation for future human missions to Mars. NASA's Jet Propulsion Laboratory in Pasadena, California, a division of Caltech, manages the project for NASA's Science Mission Directorate in Washington. 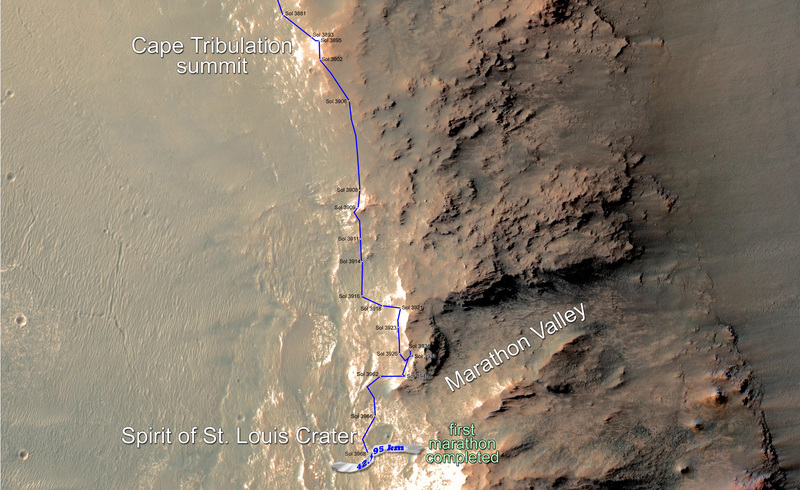 This illustration depicts some highlights along the route as NASA's Mars Exploration Rover Opportunity drove as far as a marathon race during the first 11 years and two months after its January 2004 landing in Eagle Crater. The vehicle surpassed marathon distance of 26.219 miles (42.195 kilometers) with a drive completed on March 24, 2015, during the 3,968th Martian day, or sol, of Opportunity's work on Mars. For this map, north is on the left. Image Credit: NASA/JPL-Caltech/Cornell Univ./USGS/Arizona State Univ. There was no tape draped across a finish line, but NASA is celebrating a win. The agency's Mars Exploration Rover Opportunity completed its first Red Planet marathon Tuesday -- 26.219 miles (42.195 kilometers) - with a finish time of roughly 11 years and two months. This map shows the southward path driven by Opportunity from late December 2014 until it passed marathon distance on March 24, 2015, during the 3,968th Martian day, or sol, of the rover's work on Mars. "This is the first time any human enterprise has exceeded the distance of a marathon on the surface of another world," said John Callas, Opportunity project manager at NASA's Jet Propulsion Laboratory (JPL) in Pasadena, California. "A first time happens only once." 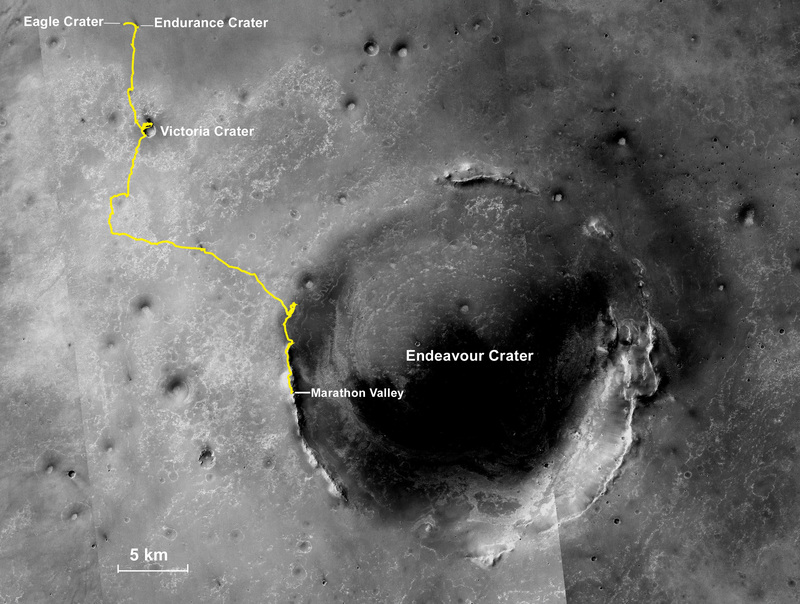 This map shows the rover's entire traverse from landing to that point. The rover team at JPL plans a marathon-length relay run at the laboratory next week to celebrate. The long-lived rover surpassed the marathon mark during a drive of 153 feet (46.5 meters). Last year, Opportunity became the long-distance champion of all off-Earth vehicles when it topped the previous record set by the former Soviet Union's Lunokhod 2 moon rover. "This mission isn't about setting distance records, of course; it's about making scientific discoveries on Mars and inspiring future explorers to achieve even more," said Steve Squyres, Opportunity principal investigator at Cornell University in Ithaca, New York. "Still, running a marathon on Mars feels pretty cool." JPL manages the Mars rover projects for NASA's Science Mission Directorate in Washington. The Mars Exploration Rover Project, NASA's newer Curiosity Mars rover, and three active NASA Mars orbiters are part of NASA's Mars Exploration Program, which seeks to characterize and understand Mars as a dynamic system, including its present and past environment, climate cycles, geology and biological potential. In parallel, NASA is developing the human spaceflight capabilities needed for its journey to Mars. NASA is exploring our solar system and beyond to understand the universe and our place in it, unraveling its mysteries and searching for life among the stars. NASA Television will air an event from 1 - 2 p.m. EDT on Tuesday, April 7, featuring leading science and engineering experts discussing the recent discoveries of water and organics in our solar system, the role our sun plays in water-loss in neighboring planets, and our search for habitable worlds among the stars. The event, which is open to the public, will take place in the Webb Auditorium at NASA Headquarters, 300 E Street SW in Washington. 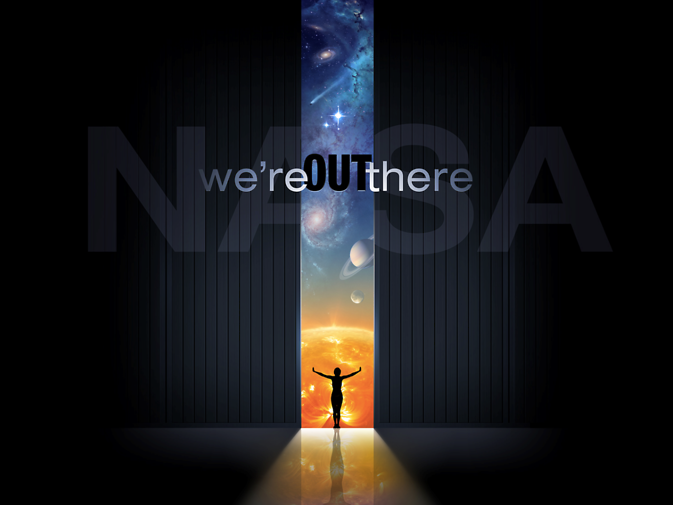 The panel also will highlight the fundamental questions NASA is working to answer through its cutting-edge science research: Where do we come from? Where are we going? Are we alone? To participate by phone, reporters must contact Felicia Chou at 202-358-0257 or felicia.chou at nasa.gov<mailto:felicia.chou at nasa.gov> and provide their media affiliation no later than noon Monday, April 6. Media and the public also may ask questions during the event via Twitter using the hashtag #askNASA.